The Papacy for a Global Church: The contemporary world situation demands a successor of Peter who, with divine assistance, can teach and direct the entire people of God. Conscious of his pastoral responsibility for the whole flock of Christ, Pope John Paul II in his 1995 encyclical letter Ut Unum Sint (No. 96) invited leaders and theologians of other churches to suggest ways in which the papal office, without prejudice to its essential features, could be exercised in ways more conducive to Christian unity. Some of the early responses seemed to say that the very existence of the primacy as it had been defined at Vatican I and Vatican II was ecumenically unacceptable. But more recently the Anglican/Roman Catholic International Commission indicated a remarkable openness on the part of Anglicans to the idea of a universal papal primacy (see Origins, 5/27/99). Individual Protestant theologians such as Wolfhart Pannenberg have seen the desirability of having a pope for all Christians. The views of others can be found in the interesting volume of essays, A Pope for All Christians? An Inquiry Into the Role of Peter in the Modern Church, ed. Peter J. McCord (New York: Paulist, 1976), with contributions by distinguished theologians representing the Lutheran, Roman Catholic, Baptist, Reformed, Orthodox, Methodist and Anglican perspectives. A number of Catholic theologians have taken the pope’s invitation as an occasion for expressing their own views on how the papal office might advantageously be restructured. Not surprisingly, the proposals have come principally from authors who are dissatisfied with current procedures. Essentially, their complaint is that the papacy has become too active and powerful. Before assessing the proposals, it will be helpful to reflect on recent trends. During the past two centuries the popes have become increasingly aware of their planetary responsibilities and have transformed the papacy into a more potent symbol of Catholic unity. The First Vatican Council (1869-70), followed by the Code of Canon Law of 1917, attributed new powers to the pope as vicar of Christ for the universal church. He received practically unlimited authority over the development of doctrine and ecclesiastical legislation. Through its expanding diplomatic corps, the Holy See came to be morally present in many nations, overseeing the affairs of the church and interacting with secular governments. With the help of nuncios and apostolic delegates, Rome controlled the appointment of bishops everywhere. At the Second Vatican Council (1962-65) bishops from Western Europe (France, Belgium, Holland and Germany), together with their theological advisers, spearheaded a program of reform that sought to restore the dignity and rights of individual bishops and give real though limited autonomy to regional churches. Missionary bishops of Asia and Africa, anxious to insert the Catholic faith more deeply into the lives of their people, welcomed the program. Without reversing the teaching of Vatican I on papal primacy, Vatican II promoted inculturation; it rehabilitated local and regional churches; it upgraded the episcopate by redefining the bishop as a priest who enjoys the fullness of the sacrament of order. It formulated the doctrine of collegiality, teaching that all bishops in communion with Rome are fellow members of the supreme directorate of the universal church. To implement these principles Vatican II initiated several structural changes. It called for the internationalization of the Roman Curia, which up to then had been almost exclusively Italian. It erected a system of episcopal conferences, one for each major nation or territory in the world. In concert with Paul VI, the council also set up a totally new institution: the Synod of Bishops, which meets periodically in Rome to deal with matters of concern to the universal church. Pope Paul VI, faithfully implementing the council’s program, made the papacy a truly global institution. He internationalized the Roman Curia and supervised the establishment of the episcopal conferences and the Synod of Bishops. Following a suggestion of this synod, he established the International Theological Commission to advise the Holy See. Setting a completely new precedent, he made pastoral journeys to the Holy Land, India, New York, Portugal, Turkey, Colombia, Geneva, Uganda and the Far East. In the course of these travels he visited the World Council of Churches in Geneva, the headquarters of the United Nations in New York and the Conference of Latin American Episcopates at Medellín, Colombia. He had meetings of great symbolic importance with leaders of other churches, including Patriarch Athenagoras of Constantinople in 1964 and 1967 and Archbishop Arthur Michael Ramsey of Canterbury in 1966. While calling for missionary evangelization, he also promoted cordial dialogues with the great religions. John Paul II is, like Paul VI, preeminently a pope of Vatican II. As a young bishop he participated in all four sessions of the council. Enthusiastically supporting its teaching, he assiduously applied it to his archdiocese of Kraków in Poland. Throughout the decade from 1967 to 1977 he was a leading figure in the Synod of Bishops. His election as the first non-Italian pope since the 16th century dramatically underlined the international character of the contemporary papacy. Like Paul VI, John Paul II sees himself as a pilgrim pope. He has made more than 100 trips outside of Italy in the 22 years of his pontificate thus far. He has spoken at UNESCO in Paris and has twice addressed the General Assembly of the United Nations in New York. He has frequently met with leaders of other Christian churches and has engaged in interreligious events at Assisi and elsewhere. In the name of social justice he has denounced oppressive regimes and supported participatory forms of government as more consonant with the dignity and freedom of the human person. The success of the bloodless revolutions in Central and Eastern Europe in 1989 has been attributed in great part to his moral influence. Although he abstains from partisan politics, no pope since the Middle Agesor perhaps in all historyhas been such a major actor on the world stage. As did Paul VI, John Paul II works collegially with the bishops of the world. He has held regular sessions of the Synod of Bishops approximately every three years. In 1985 he called an extraordinary meeting of the synod to celebrate the 20th anniversary of the conclusion of Vatican II. He has convoked special sessions of the synod for national and regional groups of bishops, including the four great assemblies for Africa, America, Asia and Europe, leading up to the Great Jubilee of 2000. John Paul II keeps in constant communication with his fellow bishops. The national and regional conferences elect representatives to the Synod of Bishops and respond to drafts of important Roman documents. When the pope travels abroad, he regularly makes a speech to the conference of bishops and sometimes enters into dialogue with its members, as he did in Los Angeles in 1987. Like earlier popes, he meets in Rome with individual bishops and groups of bishops, who come every five years to discuss with him the developments, opportunities and problems in their part of the world. In furtherance of his collegial mode of governance, John Paul II has found new uses for the college of cardinals. On five occasions between 1979 and 1994, he convoked special consistories to seek out the cardinals’ ideas and obtain their cooperation in important matters, ranging from church finances to the preparations for the present jubilee year. Far from being in competition with the college of bishops, the college of cardinals serves as a component of that college that can be summoned more expeditiously, more conveniently and more economically. For similar reasons, the pope occasionally holds meetings of archbishops or presidents of episcopal conferences. All of these mechanisms help the pope to govern the church in a collegial way, taking account of the wisdom and sensitivities of bishops throughout the world. John Paul II also believes strongly in inculturation. The faith, he believes, must be successfully incarnated in the many cultures of the world. This task, however, is a delicate one. Cultures are not morally and religiously neutral. They need to be evangelized so as to be hospitable to, and supportive of, authentic Christianity. Lest cultures become self-enclosed and divisive, John Paul II insists that they must respect universal human values. In the church, believers of different cultural regions must be able to recognize one another as fellow members of the same body, sharing the same apostolic heritage. If these conditions are met, the plurality of cultures in the church can be a positive asset. It can bring the riches of the nations to Christ the Lord, to whom they were given as an inheritance (Ps 2:8; see also Vatican II’s Dogmatic Constitution on the Church , No. 13). Many of the recent reform proposals may be seen as reactions against the global papacy of the post-Vatican II era. Seeking greater autonomy for individual bishops and local churches, Catholic reformers frequently invoke the principle of subsidiarity. John Paul II has concisely explained the meaning of this principle in his encyclical Centesimus Annus (1991): A community of a higher order should not interfere in the internal life of a community of a lower order, depriving the latter of its functions, but rather should support it in case of need and help to coordinate its activity with the activities of the rest of society, always with a view to the common good (No. 48). The subsidiarity principle was first articulated in relation to secular governments, which are established from below. Beginning with the family, people find it necessary to form successively larger communities in order to obtain benefits that cannot be assured by the smaller or lower units. But higher authorities, such as the sovereign state, should not do what the family or smaller voluntary societies can do. The state is thus an auxiliary, a subsidium, which supplements public and private agencies such as municipalities, schools, businesses, churches and clubs. It is debated to what extent, or exactly how, subsidiarity applies to the church. Unlike the state, the church was established from above, so to speak, by God’s action in Christ, who gave special powers to Peter and the Twelve. The church began to pulse with life when the Holy Spirit descended upon the church as a whole at Pentecost. Only subsequently, as the faith spread to Antioch, Rome, Alexandria and other cities, was it necessary to set up local authorities in charge of particular churches. The particular churches were, as Vatican II puts it, fashioned after the model of the universal church, which is therefore antecedent to them, even though it in certain respects depends on them (Dogmatic Constitution on the Church, No. 23). They can be called churches inasmuch as the Church of Christ is truly present in all legitimate local congregations (Dogmatic Constitution on the Church, No. 26). Because the principle of subsidiarity has been formulated with reference to secular societies, its applicability to the church is debatable. Whatever the outcome of that debate, common sense requires that merely local problems should, if possible, be handled locally. In today’s world, however, local questions often have ramifications for the universal church, and therefore require the involvement of higher authority. Besides invoking subsidiarity, the present-day reformers often argue from tradition. In the ancient church, they point out, the bishops of the apostolic sees of Jerusalem, Antioch and Alexandria were considered to have special authority in the Eastern portion of the church, as Rome did in the West. But before resurrecting the patriarchal model, one should recall the difficulties to which it led. The patriarchates quarreled among themselves, with Antioch and Alexandria seeking to eject each other from the Catholic communion. Later Constantinople, and still later Moscow, claimed patriarchal status but were hostile to each other. The Orthodox Church today is plagued by rivalries among the autocephalous national churches of Eastern Europe. Even in the West, which was blessed by having only one apostolic patriarchate, national churches posed major obstacles to unity. Nationalism contributed to the loss of Germany, Scandinavia, England and Scotland to the Catholic Church, while France, Austria, Spain and Portugal sometimes teetered on the brink of schism. The resurgence of Roman authority in the 19th century was a signal benefit. It enabled Catholics of different nations to maintain a lively sense of solidarity even through the two world wars of the 20th century. In our electronic age, when information travels with the speed of light, global authority is more important than ever. What happens today in Peoria can raise questions in New Delhi and Warsaw tomorrow. Rome cannot wait silently while doctrinal issues are debated on the local level, as it might have done when communications were slow and transportation was difficult. Today Rome is drawn in as soon as a controversy arises. The Holy See is asked to pronounce on one side or the other of the dispute. I am not suggesting that the church should go back to the pre-Vatican II situation. The conciliar reforms have enabled the church to enter into the globalized universe of our day. The council quite properly called for inculturation, collegiality and a renewed emphasis on the local church as a center of pastoral life and worship. The structures erected since the council have served well, though further experience and adjustments will be needed for them to function as smoothly as might be desired. There should be no question of choosing between centralization and decentralization. Decentralization could be disruptive and centralization oppressive unless the centrifugal and centripetal tendencies were held in balance. The process of growth at the extremities places more burdens than ever on the Roman center. In the words of Vatican II, the chair of Peter presides over the whole assembly of charity and protects legitimate differences, while at the same time it sees that such differences do not hinder unity but rather contribute to it (Dogmatic Constitution on the Church, No. 13). In the light of the principles already stated, we may turn our attention to some specific proposals for reform frequently found in recent theological literature. Five recurrent suggestions seem to merit special mention. First of all, there is the issue of the nomination of bishops. Since the mid-19th century, the selection of bishops by secular princes and by cathedral chapters has all but vanished. No Catholic wants to go back to the old system in which civil governments practically chose most of the bishops. Under the present system, the papal nuncio or delegate has major responsibility for gathering names from his personal knowledge and from consultation with appropriate persons. The appointments are then discussed in the Vatican’s Congregation of Bishops, which includes bishops from different regions, who make their own suggestions. The pope receives all the recommendations and makes the final choice. Many reform-minded theologians would like a more open and democratic process in which names are submitted by the local church, filtered through the national or regional conference of bishops, and eventually proposed to Rome for approval or disapproval. Since the process of appointment is always subject to improvement, suggestions of this kind should not be rejected out of hand. But the proposals I have seen are not free from weaknesses. By erecting representative committees they would unleash factionalism and political power struggles within local churches. By considering only names surfaced within the diocese, they would also create a risk of excessive inbreeding. A church with an eccentric tradition would perpetuate its own eccentricity rather than correct it. Confidentiality, moreover, could hardly be maintained if names had to be filtered through a succession of committees. In the end, Rome would be under pressure to choose the names proposed or to explain why it was not doing so. But to divulge the reasons against an appointment might be injurious to the candidate’s reputation. And finally, it may be said, the current process allows consideration of a larger pool of possibilities than would be familiar to any diocesan committee. Although mistakes are occasionally made, the existing procedure, in my opinion, has given us a generally excellent body of bishops who can be trusted to serve as faithful pastors of their flocks. They compare favorably with the elected bishops of other churches. A second issue has to do with the powers of the Synod of Bishops. As presently constituted, it consists primarily of bishops elected by their respective episcopal conferences, which are represented according to their relative size. Plenary sessions are held about once every three years and are relatively briefnot more than a month in length. The bishops could hardly afford to be absent from their sees for longer or more frequent periods. The synod is not a legislative body but a forum for the bishops to express their views on the theme of the meeting and ascertain the degree of consensus among them. The synod assemblies often make useful suggestions to the pope and the Curia. The apostolic exhortations that issue from these assemblies have demonstrated the value of the synodal process. There are voices in the church that would like to see the synod transformed into a body that could enact laws and issue binding doctrinal pronouncements. Given the ad hoc make-up of the assemblies and the relatively brief time of the meetings, I am inclined to disagree. I doubt that the Catholic faithful would wish to be bound by the decrees of such an assembly. The pope can, of course, give the synod power to decide some issue by majority vote, but he has thus far preferred to seek recommendations from the synod and let the Roman congregations follow up with the necessary action. The assembly of 1985, for example, made four major recommendations: the early completion of the Code of Canon Law for Eastern Catholic churches, the preparation of a universal catechism or compendium of Catholic doctrine, a study of the nature and authority of episcopal conferences and a study of the applicability of the principle of subsidiarity to the internal life of the church. In his closing speech the pope accepted the first three suggestions, all of which have been carried out in subsequent years. As for the principle of subsidiarity, it seems well to allow the question to mature in theological literature before the magisterium makes a formal pronouncement. A third issue under discussion is the role of the episcopal conferences, such as, in the United States, the National Conference of Catholic Bishops. As constituted by Vatican II, they are primarily consultative in nature. They permit the bishops of a nation or region to benefit from one another’s wisdom and coordinate their policies as they govern their own dioceses. The conferences do not normally make binding legislation, but they can do so on occasion either by unanimous vote or by a two-thirds majority together with a formal approval (recognitio) from Rome. In the summer of 1998, the pope published a letter in which he clarified the nature and doctrinal authority of episcopal conferences, as the Synod of Bishops of 1985 had requested. He ruled that the conferences could not teach obligatory doctrine without a two-thirds majority followed by Roman recognition. Some critics contend that this ruling showed excessive distrust of the conferences. But Vatican II did not establish the conferences as doctrinal organs. How could the Catholic people in the United States be bound by a vote of their bishops to profess some belief that was not taught throughout the church? Do the diocesan bishops and the Catholic people really want to be bound in matters of doctrine by the majority vote of their bishops’ conferenceespecially if it be a small conference that might have less than a dozen members? A fourth point under discussion is the power of the Roman Curia. The pope cannot effectively govern the universal church without a kind of cabinet consisting of the Roman congregations, tribunals and councils. The heads of these organs are normally bishops and, in the case of congregations, cardinals. Diocesan bishops often complain that Rome is interfering too much in the affairs of the local churches. But Rome rarely intervenes on its own initiative. It is usually responding to complaints from the local church against some questionable proceeding. A couple of examples may be helpful. In 1993 Rome intervened to quash a rather free and inaccurate translation of the Catechism of the Catholic Church that was about to be published over the protests of the authors of the catechism and other experts. An international consultation was held in Rome, as a result of which the translation was held up and revised. A recent issue that has attracted some attention is the decision of the Congregation for Divine Worship and Sacraments on Oct. 26, 1999, to review English translations of the liturgy composed by the International Committee for English in the Liturgy (ICEL), a rather cumbersome joint commission with members appointed by 11 conferences of bishops. For some years now, the texts produced by this body according to its own philosophy of translation have met with mounting criticism from bishops and groups of the faithful; but the commission, being international, is not under the authority of any bishops’ conference. The United States bishops found themselves in the anomalous position of not being able to control the texts of their own liturgical books. The new regulations have the advantage of giving the bishops’ conferences an agency to which they can appeal for correcting what they perceive as deficiencies in the ICEL texts. In this case, as in many others, the authority of Rome functions to protect local churches from questionable exercises of power by national or international agencies. In doctrinal matters, Rome’s policy has generally been to encourage the diocesan bishops and the bishops’ conferences to take greater responsibility for overseeing the orthodoxy of what is preached and taught in their respective areas. But the bishops usually rely upon Rome to assure them that they are teaching in communion with the universal church, since doctrines are by their very nature universal. The Congregation for the Doctrine of the Faith cannot avoid being drawn into discussions where questions of orthodoxy are raised. A fifth and final question has to do with papal teaching authority. The present pope, like Paul VI, has thus far refrained from issuing ex cathedra dogmatic definitions, but he has several times made conclusive doctrinal determinations without any formal vote by the college of bishops. In these cases he has used his own authority as universal primate to confirm the brethren (Lk. 22:32), authoritatively gathering up the general consensus of bishops, past and present. Some theologians apparently hold that the pope ought to conduct a poll or call for a vote before issuing such pronouncements. But it may be answered that even if a few bishops disagree, the voice of the pope together with a solid majority of bishops over a long period of time obviates the need for a head count. Such cumbersome processes could easily prevent a timely and effective response to critical situations. Since Vatican II the principal drama within the Catholic Church has been the dialectical tension between centralizing and decentralizing tendencies. The decentralizers tend to see themselves as progressives and to depict their adversaries as restorationists, but the opposite case can equally well be made. Those who want to reinstate the conditions of patristic Christianity tend to be nostalgic and anachronistic. In the end, the question should not be posed as an either/or. Precisely because of the increased activity of particular churches and conferences, Rome is required to exercise greater vigilance than ever, lest the unity of the church be jeopardized. The global character of the Catholic Church today, together with the rapidity of modern communications, makes ineluctable new demands on the papal office. It will be for members of other churches to judge whether a strong and energetic papacy is ecumenically acceptable. More than a few, I suspect, are looking toward Rome to provide effective leadership for the entire oikoumene (the whole inhabited world). The contemporary world situation, as I understand it, demands a successor of Peter who, with the divine assistance, can teach and direct the entire people of God. The Petrine office, as it has developed since Vatican II, has a unique capacity to hold all local and regional churches in dialogue while reaching out in loving service to all. Paul VI and John Paul II are to be praised for having discharged this mission with loyalty, strength and openness to the Spirit of God. In “The Papacy for a Global Church” on the issues that Avery Dulles, S.J., poses for reform consideration (7/15), my question is: Where is the Holy Spirit? Is the Spirit with ordinary people prayerfully nominating a bishop? Is the bishop with a group of local bishops struggling to speak the Gospel in the wider community? Is the Spirit with a committee like ICEL as they let human words express eternal truth? Or is the Holy Spirit primarily residing in Rome with occasional excursions to the larger church? I read with great care and interest the article by Ladislas Orsy, S.J., “The Papacy for an Ecumenical Age: A Response to Avery Dulles (10/21). It was refreshing to watch Father Orsy point out the “fussy” translating, method and theological reflection employed by Father Dulles in his article, “The Papacy for a Global Church” (7/15). The crowning achievement of the article was Father Orsy’s astute observation that Father Dulles used the literary genre of rhetoric, providing his readers with a “thesis” about the papacy requiring no change. Father Dulles argued for the status quo, Father Orsy for a new enterprise utilizing the genre of theological disputation. Father Orsy, following the ancient dictum, “in all things charity,” carefully shoots holes in Father Dulles’s argumentation and concludes with powerful suggestions for the future. While he asks Father Dulles to join in the holy enterprise, I was shocked that he did not ask everyone else in the church to do so. The Holy Spirit resides in all the members of the church, even those of us who do not take an oath of fidelity. 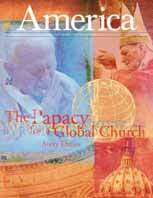 This article also appeared in print, under the headline "The Papacy for a Global Church," in the July 15, 2000 issue. Avery Dulles, S.J., is the Laurence J. McGinley Professor of Religion and Society at Fordham University in New York City. This article is based on the McGinley Lecture given on March 22, 2000.